Hostel incrível, staff super atencioso e pronto pra ajudar! Voltaria com certeza. Hostel incrível! Muito espaçoso e com várias a´reas em comum. Ambiente jovem muito bom e descontraído, staff muito simpático. The hostel is a bit far from the center, which makes it less comfortable to go sightseeing. The staff is nice and helpful and the hostel is very clean. The breakfast is very simple, just cereals and bread. There is no bathroom for girls in the last floor, so if your room is there you have to take the stairs for the floor bellow, which is not cool at night. 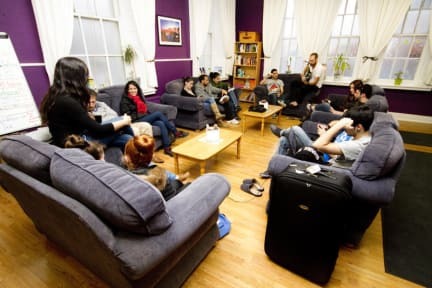 O hostel era muito bom. Camas e quartos limpos, aquecedor funcionando bem. Armários bem espaçosos. Os pontos ruins foram: - a cozinha (MUITO SUJA), não tinha como cozinhar lá. - Wifi não pega nos quartos, o que é muito incômodo. Tem que descer nas áreas em comum para ter acesso. This hostel is very nice! They offer a good breakfast, rooms and bathrooms are clean and organized. The hostel offers good facilities, as a TV room, vending machines, lockers, etc. During my stay, the hostel was out of internet during a day, but the problem was solved and after that, I was able to connect even from the room. About the location, the hostel is near an important avenue, where we can easily take a bus to the airport. It's not very close to the City Centre by foot (about 25 min).